Keep the information with the job! The perfect way to keep customer job tickets organized is to keep the information with the job! 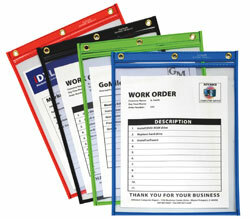 Stitched Shop Ticket Holders with a Hanging Strap let you hang your job tickets right with your jobs. Great for hooks, pegs, vehicle mirrors, or machinery. Stitched seams for long-lasting utility. Clear on both sides. 9 x 12. 15/BX. Learn about the wide variety of shop ticket holders at C-Line..
Shop Ticket Holder Special Features: Strap plus extra large hanging grommet.